Pillow-soft comfort meets hybrid efficiency. Hybrid electric vehicles are a tough sell. But especially so when gasoline prices are low. Manufacturers such as Toyota have invested billions of dollars in the technology and aren’t about to walk away. At some point fuel prices are likely to rebound, raising demand with it. Lexus is Toyota’s luxury marque and has almost as many hybrid models (six) as does the eponymous Toyota brand (seven). Only one model, the CT, is a dedicated hybrid. The other five are based on standard gasoline-powered versions. Under optimum conditions, all six deliver outstanding fuel economy, typically bettering diesels which Lexus does not offer. At least not in North America. Under less than optimum conditions (i.e., cold weather, icy roads, or using four-wheel drive), your fuel economy can drop by 31 to 34 percent, according to the EPA. A 2016 Lexus ES 300h was a recent weekly driver, the hybrid version of the Lexus ES 350, a front-wheel drive midsize luxury sedan. Whereas the ES 350 is powered by a 3.5-liter, V-6 making 268 horsepower and a combined 24 mpg, the 300h has a 2.5-liter, four-cylinder engine, and an electric-drive motor. Fuel efficiency is this model’s strong suit, coming in at an EPA-rated 40 mpg. 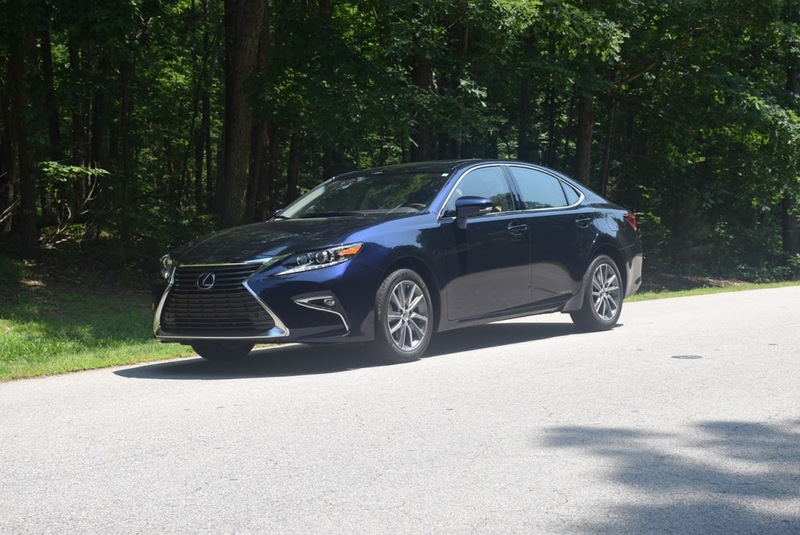 The Lexus ES 350 and ES 300h have a solid pedigree, underpinned by a modified version of the platform powering the Toyota Camry as well as the similar Toyota Avalon. There is no front-wheel drive variant and that means torque steer is evident at times, but it is hardly an issue. That fact should be much comfort for people who want a roomy luxury car, but don’t want the disappointment of a handling issue. And if handling is your be all and end all, then the slightly smaller rear-wheel drive IS line should be your choice. Alas, there is no IS hybrid for your consideration — you’ll need to step up to the rear-wheel drive GS Hybrid sedan to enjoy that advantage instead. The ES line is one of two models which helped Toyota launch the Lexus brand in 1990. Six generations of this sedan have been built, but it was only with the 2013 launch of the current-generation model a hybrid variant has been offered. For 2016, both versions are refreshed with plentiful updates accomplished in and out. Rolled out are four new colors and expanded standard features in an effort to keep Lexus’ best selling sedan relevant. And despite sedan sales falling as much as 20 percent this year as consumers continue to pursue SUVs in greater numbers, ES sales are down by only 6 percent. The most significant changes for the 300h this year include the addition of standard LED headlamps with daytime running lights. The spindle (hourglass) grille is back and now features a one-piece design. Even the 17-inch wheels were reworked to showcase an all-new look. Inside, the cabin remains as quiet, elegant, and well-fitted as before. The instrument panel now offers a standard 4.2-inch color multi-information display, utilizing a thin-film-transistor (TFT) liquid-crystal design for optimum clarity and contrast. Cabin finishes include flaxen, dark mocha wood, piano black wood, and bamboo with a matte finish. The test model (base $40,920 sticker price) came with the ultra luxury package wood trim interior ($3,000 upgrade) delivering a wood and leather-trimmed tilt and telescopic steering wheel/column; heated and ventilated front seats; power memory seats up front; power rear and manual back side window screens; a driver seat cushion extender (a must have for long trips); and ambient lighting. This package lifts the ES to another level, bringing top-end Lexus comfort to this mid-range offering. Another change made in 2016 involves the availability of the latest Lexus Safety System+ ($1,015 upgrade) combining a pre-collision system, high-speed dynamic radar cruise control, lane departure alert and assist, and intelligent high beam control. If you want a taste of semi-autonomous driving and an improved level of safety, then add this package. The 2016 Lexus ES also secured the highest test rating (Top Safety Pick+) from the Insurance Institute for Highway Safety (IIHS). It also secured a “superior” score for an available crash avoidance & mitigation system — Lexus Safety System+. Other luxury touches include puddle lamps, available illuminated door sills ($379), a power tilt and slide moonroof, Siri Eyes Free, navigation (or enhanced navigation with a Mark Levison sound system ($2,650), and an assortment of tech features, including Bluetooth connectivity. My test model added these features as well as a blind spot monitor ($500), intuitive parking assist ($500), a one-touch power trunk ($400), rain-sensing wipers ($135), as well as the wood and leather-trimmed steering wheel ($450). The final price for my weekly driver came in at $51,164. Manufacturers continue to equip larger vehicles with smaller engines. It is a trend that began after the last recession and gained traction as gas prices pushed ever higher. And with a federal 54.5 mpg fleet average fuel mandate for 2025 fast approaching, smaller engines are here like them or not. The ES 300h is powered by a 2.5-liter, four-cylinder engine making just 156 horsepower and is paired with an electronically controlled continuously variable transmission. When combined with the electric motor, there’s 200 horsepower at the ready. That’s still a far cry from the 268-hp rating for the V-6 engine, but the combination is an effective one when maximum power is required. More than once I set the tires spinning as I sought to get the upper hand while switching lanes or when picking up speed on a highway entrance ramp. These incidences weren’t planned and the sedan’s response was a pleasant surprise. Hybrids are still widely misunderstood — such models are efficiency kings, but they’re certainly no laggards. Also working to the ES 300h’s advantage is its 3,660-pound efficiency — that’s just 89 pounds heavier than the standard model and several pounds lighter than competing models. Lexus vehicles do not offer uniform steering and handling across the product line. Some models such as the IS, RC and the GS are engineered with handling in mind. Many others, including the ES, place an emphasis on comfort and safety. Let’s just say Lexus has carefully surveyed the market to understand what consumers want. As one of the best selling luxury brands in the US, Lexus reads consumer sentiment remarkably well. The IS, RC, GS, and LS offer standard rear-wheel drive and come in closer to an ideal 50-50 front-to-rear weight distribution, what usually ensures a much more balanced drive. On the other hand, front-wheel drive models such as the ES have more weight sitting over the front wheels, in this case a 59-41 ratio found in the ES. That difference becomes more noticeable when tackling twisty roads or when pressing the pedal to the metal. Steering is uninvolved and some might say it is vague. Remove all expectations of a fun-to-drive experience here as everything about this sedan is built around a plush cabin, a soft ride, and fuel economy optimization. Otherwise the IS sedan or better yet the RC coupe will satiate your need for handling optimization. The hybrid’s back seat is roomy and seats three comfortably. The ES is a true, no comprises five-passenger model. One big difference between the gas and hybrid versions is in trunk space. The hybrid’s battery is found under the rear seat back and intrudes into the trunk. That means the 15.2 cubic-foot trunk in the ES 350 shrinks to just 12.1 cubic-feet in the hybrid. Keep this in mind if you need maximum packing space. It is hard to make a case for a hybrid when fuel prices are so low. The ES hybrid carries a $2,920 price premium over the standard model, a cost premium not easily recouped these days. Unlike some luxury brands, Lexus typically doesn’t run nationwide sales events — discounting can vary, depending on where you live. A lease deal and low-rate financing are usually offered, but the cash difference remains. What you want to do is close the price gap between standard and hybrid models to make the latter a value proposition you can live with. 2016 Lexus ES 300h photos copyright Auto Trends Magazine.